Diagnosis of an acetabular labral tear may be difficult as there seems to be limited information on the diagnostic usefulness of the patient history, clinical examination findings, magnetic resonance (MR) arthrography and response to intra-articular hip injections. The gold standard for diagnosing an acetabular labral tear is considered to be direct visualization by arthroscopy. A medical physician may wish to utilize less invasive measures to make a diagnosis such as MR arthrography and or intra-articular hip injections with anesthetic. Magnetic resonance arthrography as a diagnostic test for acetabular labral tears has been shown to demonstrate 66%-71% sensitivity and 44%-75% specificity. The accuracy of intra-articular injection of anesthetic to determine an intra-articular abnormality has been found to be 90%. The physical examination and report of symptoms from the patient is also important when diagnosing a labral lesion. A systematic review of the literature found that anterior inguinal pain appears to be highly sensitive when diagnosing a labral lesion. The authors of this review also discovered several special tests to be highly sensitive. These include the flexion-adduction-internal rotation test (Sn 0.95-1.0) , the flexion-internal rotation test (Sn 1.0), impingment provocation test (Sn 1.0) and the Fitzgerald test (Sn 1.0). The high sensitivity of these tests may give one confidence when attempting to determine if a labral lesion is absent. ↑ Martin RRL, Irrgang, J.J., Sekiya, J.K. The Diagnostic Accuracy of a Clinical Examination in Determining Intra-articular Hip Pain for Potential Hip Arthroscopy Candidates Arthroscopy: The Journal of Arthroscopic & Related Surgery. 2008; 24(9): 1013-1018. ↑ Lewis, C., Sahrmann, S. Acetabular labral tears. Physical Therapy. 2006; 86: 110–121. ↑ Keeney, J.A., Peelle, M.W., Jackson, J., Rubin, D., Maloney, W.J., Clohisy, J.C. 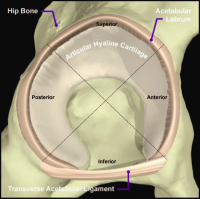 Magnetic resonance arthrography versus arthroscopy in the evaluation of articular hip pathology. Clinical Orthopedic Relat Res. 2004; 429: 163-169. ↑ 4.0 4.1 Byrd, J.W., Jones, K.S. Diagnostic accuracy of clinical assessment, magnetic resonance imaging, magnetic resonance arthrography, and intra-articular injection in hip arthroscopy patients. American Journal of Sports Medicine. 2004; 32: 1668-1674. ↑ Leibold, M.R., Huijbregts, P.A. Jensen R. Concurrent Criterion-Related Validity of Physical Examination Tests for Hip Labral Lesions: A Systematic Review. Journal of Manual and Manipulative Therapy. 2008; 16 (2): E24–E41.